There are two speeds for Roger Federer. The most common is that of a game that is beyond textbook — fluid strokes that result in shots landing exactly where they should land. But when that’s not happening, it’s the complete opposite. Huge misses and utter chaos from the moment the ball and the racket imperfectly meet. On Sunday, at age 32, Roger Federer was a handful of points away from becoming the oldest Wimbledon gentlemen’s singles champion in the Open era, which would have given him a record-setting eighth title at the All England Lawn Tennis Club and further distanced him from the pack with an 18th Grand Slam title. But then he lost. As he increasingly does in Grand Slams. Because at some point, it has to end. I couldn’t help but marvel during Sunday’s five-set thriller (especially during Federer’s fourth-set comeback) in the reality that each classic match could be the last. And that the time for taking his greatness for granted must end, immediately. Here is the thing that I love the most: the Federer Shank. A shank is exactly what it sounds like. It’s a mishit, often producing a pingless sound. The ball’s contact with the racket’s noncentral strings, frame, neck, or even grip sends it wherever said mishit so pleases. You can’t control or guide a shank; all you can do is hope for the best. Shanks don’t always result in errors. Sometimes they hit off the racket’s frame and wind up eight rows deep in the stands. But other times the accidentally hit shot lands in, causing an English-infused bounce that the other player typically isn’t prepared for, thus putting that player instantly on the defensive. They’re ugly. And in a perfect world, they never happen. Which is why it’s so astounding that the Most Likely To Shank And Then Sometimes Succeed But Often Times Not title belongs to Roger Federer. As if he needed any more titles. There are two speeds for Roger. The most common is that of a game that is beyond textbook — fluid strokes that result in shots landing exactly where they should land. But when that’s not happening, it’s the complete opposite. Huge misses and utter chaos from the moment the ball and the racket imperfectly meet. When you see Roger respond to one of these shots, he seems to move on immediately. As if he knows, based on his game, it’s bound to happen a few times a match. And when you think about the position he has put himself in for the majority of his career, it makes sense. He essentially handicapped himself, forcing a game in which there were only two options: perfection or madness. 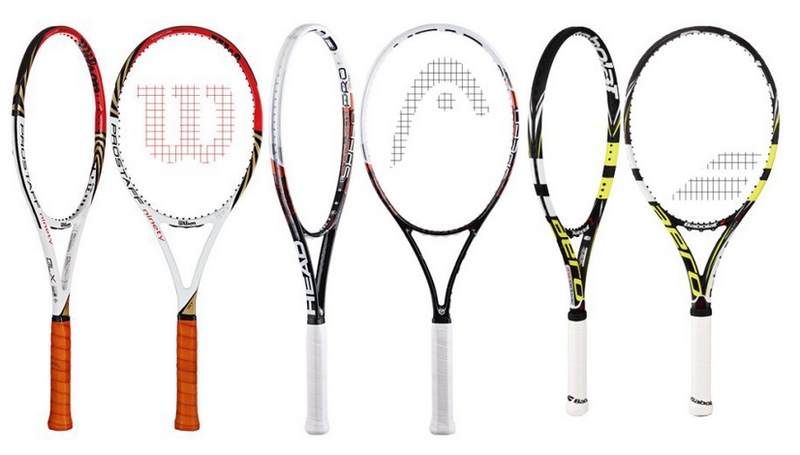 For each of Federer’s 17 Grand Slam wins, he used the same style of racket, a 90-square-inch Wilson. Up until this past year, when Federer shocked the tennis world by switching to a 98-square-inch frame, he played with the smallest and heaviest racket among the elite players, a decision that was equal parts admirable, stubborn, and cocky. And because — pre-switch — he had decided to stick with what he knew, the Federer Shank had been allowed to flourish. The larger the racket face is, the larger the “sweet spot” is for a player to strike the ball, which in turn means the racket is more forgiving to imperfect ball striking. Which, realistically, means the racket begins to do much of the work for you. Your equipment bails out your game. As for weight, the decision to stick with a heavier racket means investing more in control than power. Think of it like a bicycle in low and high gears. When the bike is in high gear, the push-back is minimal; you don’t have to exert much energy to get the machine going. What you lack in control, you gain in speed and distance covered. But in a low gear, you and your bike almost feel like one, even if distance and speed are more compromised. That’s how it is with a heavier racket. It feels like an extension of your arm. You can’t “arm” or “wrist” it, as they say, because your whole body needs to be part of the swing. But the result, if carried through skillfully, is something that can’t be duplicated with a lighter racket. It’s a different kind of power and a different kind of feel, almost as if you and the racket are guiding the ball exactly where it needs to go. This is the world Roger lived in for years. And it begins to explain why his game looked like no one else’s on tour. He was hitting with a racket that was evolutionarily closer to its wooden ancestor than its feather boa–like progeny. And the result was always flawless when under control, and “hide your kids” if even the slightest bit off. There’s always been something relatable to watching the best player, perhaps ever, screw up so royally. Because if you’ve played tennis, you’ve been there. The only difference is that when it happens to us, we bang our racket, curse the heavens, and begin to question our entire game. Roger just moves on to the next point. Because he seems to understand the position he put himself in: To get all of the good, he had to live with some of the bad. In his 2014 run with a new racket, I have noticed Federer Shanks happening less frequently. Or at least it feels that way (as SI’s Jon Wertheim once noted in a mailbag, there should be a shanks statistic). Regardless, it’s nice to see him — even in the most important of matches — duff one 10 feet out of bounds. It’s good to know that, while adjusting to the times and giving in to the more advanced technology afforded to him, that shank muscle memory hasn’t fully left him. Because the way that he misses doesn’t suggest human error. The mistakes are so bad, they scream glitch, as if he’s some sort of machine. Which is exactly how I want to continue thinking about Roger Federer, somewhere between tennis God and robot. Either way, not one of us.